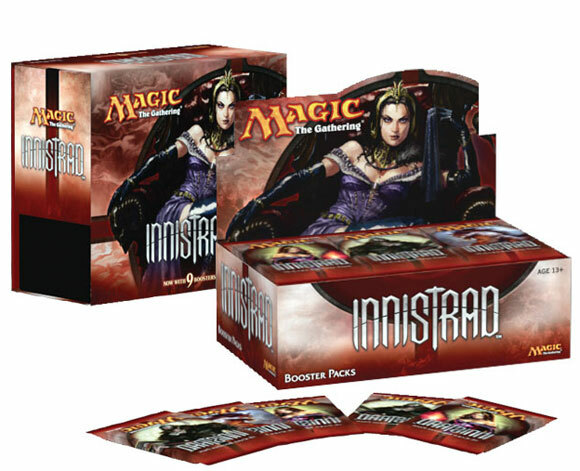 Innistrad features 264 black-bordered cards, including randomly inserted premium versions of all cards in the set. It is available in booster packs, intro packs, and fat packs. For the first time ever, Innistrad brings double-faced cards to Magic. Innistrad has a gothic horror theme and makes use of horror tropes. It is the first set to thematically take place on the plane of Innistrad. The set features graveyard and tribal mechanics, with the five main tribes each being split over an allied color pair. Spirits primarily in white and blue, Zombies in blue and black, Vampires in black and red, Werewolves in red and green, and Humans primarily in green and white. In each of these pairs, the second color is considered the primary. There are also slight thematic differences between the tribes depending on the color, such as blue zombies being abominations of science in the vein of Frankenstein’s Monster, while black Zombies are shambling corpses reanimated by magical spells. The set is considered a large set with 264 cards, which is 15 more cards than any large expansion in recent history had. Innistrad also features a number of Double-faced Cards which have a card frame printed on each side, and a checklist card used to prevent decks from becoming marked by containing them. The checklist card replaces the basic land in three of every four boosters. Due to basic lands becoming more rare, Innistrad only contains three basic land artworks rather than the usual four, further enlarging the number of functionally different cards. Additionally, Double-faced cards are on a different print run than regular cards, and every booster pack will have a double-faced card. This means that boosters can have two (mythic) rares without either being foil. Innistrad is the first set to have cards with different card backs. These cards have two card faces on each side, and are used for the transformation mechanic, changing creatures into different creatures and back by turning the card over. When playing with Double-faced Cards, players may use a checklist which has a regular card back and the player marks on the card which double-faced card the checklist card is supposed to represent. Whenever the card is in a public zone, the checklist card is replaced with the double-faced card. Playing with only the double-faced card is also allowed if the player is playing with opaque sleeves. The transformation mechanic simply consists of the word “transform” written on the card in a sentence, similar to sacrifice, counter, or flip. The mechanic also introduces new symbols representing a sun and a moon which appear to the left of a card name similar to the tombstone icon marking graveyard based mechanics in Odyssey block. The symbols specifically indicate the creature before transformation (day) or after transformation (night). Transforming creatures always enter the battlefield as they are before transformation, and once transformed not all creatures can transform back. During transformations, Auras, Equipment and Counters stay on the creature. Innistrad also introduces a new subtype for Enchantments named “Curse”, which are simply Auras which enchant players and have a detrimental effect. The set is partially graveyard based and features the return of flashback which originated in Odyssey and was reprinted during Time Spiral block. It also introduces the keyword action Fight, which represents the ability of Arena or Tahngarth, Talruum Hero. Two creatures that fight deal damage equal to their power to each other. Innistrad also features the new ability word Morbid in which creatures get benefits if another creature died the turn they entered the battlefield. The set also makes use of tribal mechanics, with Vampires, Zombies, Werewolves, Spirits and Humans giving bonuses to each other and have abilities that work against other tribes. A small theme of using +1/+1 counters is also used in the set, particularly with Vampires growing stronger by dealing damage. Liliana Vess returns as a new card named Liliana of the Veil. Garruk Wildspeaker also returns on a new card, named Garruk Relentless. Garruk Relentless is a double-faced card and the first Planeswalker card with five loyalty abilities. It is also the first Planeswalker card with a continuous triggered ability and the first green-black Planeswalker. As a gamer who first got in to CCGs with Magic back around the time of Revised Edition and out again after the Apocalypse set, I was a bit rusty with the game, but after playing in the Innistrad pre-release on a pure whim, I was hooked once more on the game. While not as powerful a set as previous expansions had been (from what I heard), the flavor and story of the new plane of Innistrad hooked me instantly. As a player who only plays MtG in Limited format events, Innistrad has everything I want and more. Fun balance, creative tropes and a sense of menace surrounding every drawn card. Will it turn the constructed fields on their heads? Not at all, but I get the feeling it wasn’t supposed to. I highly recommend this story block for players to reintroduce themselves to the original CCG. 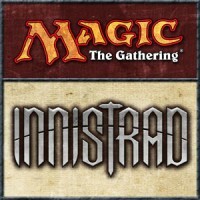 Add a Review for "Magic: The Gathering – Innistrad"